The Broken World expansion is unavailable digitally, and installing it manually on digital versions will significantly decrease the framerate. GameSpy online services have been shut down. Since the Windows 10 Creators Update the mouse no longer works in the main menu, except when using Windowed or Borderless Fullscreen. See No Mouse Cursor. The Steam version has no multiplayer and does not include the Broken World expansion. Use the nointro=true command line argument. Use fullscreen=false command line argument. 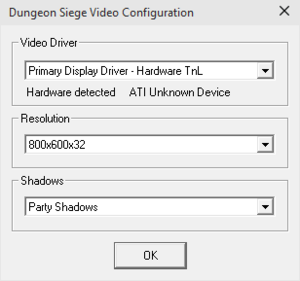 Set windowed mode and use a borderless tool. 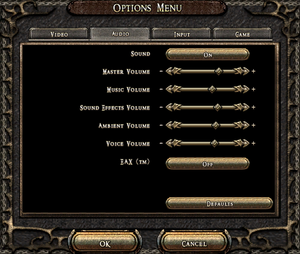 Music, Sound Effects, Ambient, Voice. The Steam version does not include multiplayer. For 8 player co-op use oldschool=true parameter. 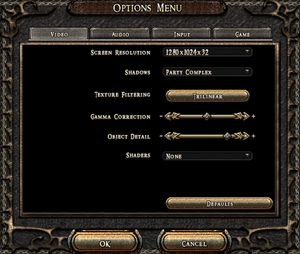 To prevent the UI from being almost unusable (see notes), you have to set 'No Size Change' for the game within the Borderless Gaming application. 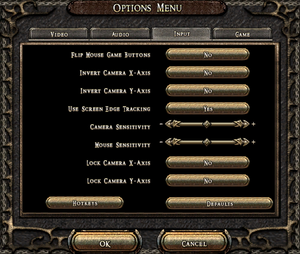 This causes the main menu to use the monitor resolution, making the UI appear in the top-left corner. Furthermore, the UI in-game will be hard to navigate, because cursor position does not fit position of icons. ↑ 1.0 1.1 File/folder structure within this directory reflects the path(s) listed for Windows and/or Steam game data (use Wine regedit to access Windows registry paths). Games with Steam Cloud support may store data in ~/.steam/steam/userdata/<user-id>/39200/ in addition to or instead of this directory. The app ID (39200) may differ in some cases. Treat backslashes as forward slashes. See the glossary page for details.